MOVEABLE FEAST Coogan (left) and Brydon take their act to the land of Picasso and Cervantes, both of whom figure into the unscripted fun. Whenever I read that Michael Winterbottom has a new installment in his Trip series on the way, I immediately do two things: 1. contact my connection at IFC Films and arrange for a screener to be overnighted the moment one's available, and 2. fondly recall the late, great Gene Siskel. Roger Ebert got all the glory, but Siskel was my favorite. He bore a striking resemblance to my father, and I admired his fierce intellect and quick wit. Like cartoonist Alison Bechdel, he invented a test for measuring a movie's merit, asking, "Is this movie more interesting than a documentary about the same actors having lunch?" Siskel didn't merely conceive of an elegantly simple tool. He anticipated the premise of Winterbottom's unlikely hit franchise. The British director has now made three vérité-style films revolving around little more than actors Steve Coogan and Rob Brydon having lunch. And dinner. Of course, they have those meals in some of the world's finest eateries. And, while doing so, they entertain the viewer — and each other — with a patented mixture of improvised humor, celebrity impressions and meditations on everything from mortality to their careers. There's never been anything like these films, and the latest will leave you hoping additional courses are yet to be served. 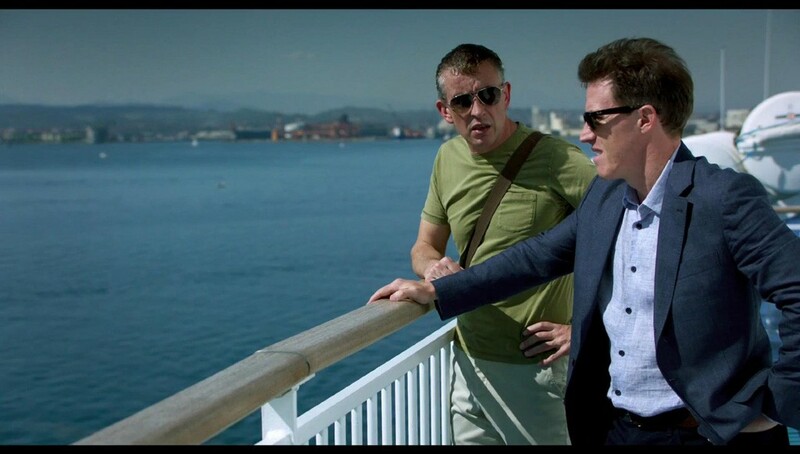 Coogan and Brydon are in top form. Once again ostensibly on assignment to write restaurant reviews, the pair travels the length of Spain, stopping at breathtaking locations to wine, dine and opine. Since they visited Italy in 2014, some things have changed. Both are now in their fifties and trying to convince themselves that's life's "sweet spot." Other things remain the same. The two are professionally competitive, so Coogan's endless references to 2013's Philomena and the Oscar nomination he received for cowriting it make for an on-the-money running joke. The bon mots, impressions and one-upmanship are stellar and nonstop. Highlights include riffs on Mick Jagger's mating habits and a rumination on the death of David Bowie that's simultaneously moving and hilarious. Both men do amazing impersonations of the singer, and the occasion offers Brydon an opportunity to get the better of Coogan by revealing that Bowie followed him on Twitter. (He did; I checked.) The news rattles Coogan. His reaction is priceless. Throughout, Winterbottom evinces an unerring instinct for which elements of the series to tweak and which to leave untouched. James Clarke's lensing of gorgeous landscapes and gourmet dishes echoes that of the first two films. This time around, however, the focus of the stars' interplay shifts from movies to music. Where previous installments were saturated with impressions of Michael Caine and Al Pacino, this one benefits from the unexpectedness of the Bowie and Jagger bits, along with a stab at Paul McCartney and a wistful fixation on the 1968 ditty "The Windmills of Your Mind." At this point, these guys feel almost like family — extraordinarily talented, erudite and funny family. I can't wait to spend time with them again. How refreshing that, in an entertainment landscape dominated by mega-budget comic-book franchises, a series as unassuming, offbeat and CGI-free as this one flourishes. Not that these pictures don't employ special effects. They do: the freakishly agile comic sensibilities of Coogan and Brydon. To date, the total running time of the trilogy clocks in at 328 minutes, and every word of dialogue they've spoken was ad-libbed as the cameras rolled. That, I think we all can agree, is more than a little trippy. The original print version of this article was headlined "The Trip to Spain 5"
The Trip to Spain is not showing in any theaters in the area.